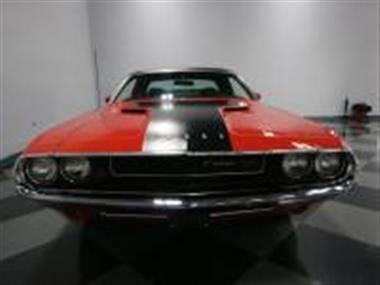 1970 Dodge Challenger in La Vergne, TN for sale. 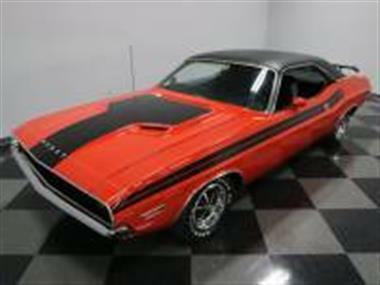 Its hard not to get excited about this 1970 Dodge Challenger R/T Tribute. 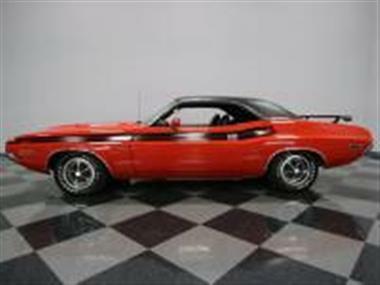 After alland#44; its a beautiful coupe with all the right sporty touches and a 383 V8 with four-speed from the height of the muscle car era. And thats before you remember how fewer cars Chrysler built than its Big Three counterparts.<br /> <br><br> The theme of this car is a thoughtful muscle machine. The red paint has that exceptional high gloss shine that says there was not only an investment in a professional applicationand#44; but also the sheetmeal. These doors close with more authority than ones from the factory ever could. 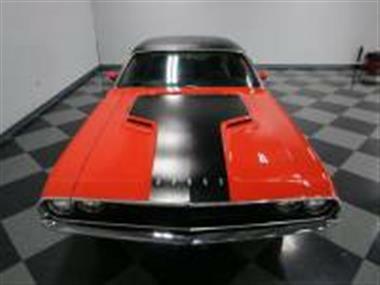 Just as bold as the red as all the aggressive black touches such as the matte finish drawing attention to the scooped hoodand#44; the fresh vinyl roofand#44; extra wide rear spoilerand#44; and the dual side stripes from the 71 package that highlights the curvy rear fenders. But this is not a completely dark affair. There are the mirror-like chromed bumpersand#44; full-width taillights that are bright and clearand#44; and iconic Mag wheels.<br /> <br><br> Chryslers black bucket seat interior gets high marks for both style and comfortand#44; and even today this is a great place to spend some quality time. The high-back bucket seats have a nice intricate pattern that is in superior condition thanks to an investment in new seat covers. The headlinerand#44; carpetingand#44; and door panels all have a similar look of quality from a proper restoration. This is a very driver-oriented setup with the controls for the heat as well as the upgraded AM/FM/cassette stereo all within easy reach. 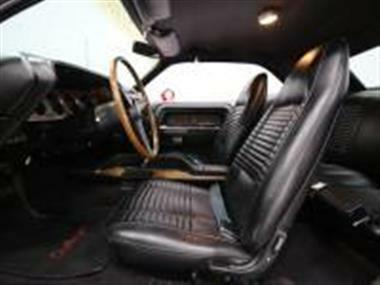 The woodgrained steering wheel matches the dashand#44; doorsand#44; and the desirable center console. And yesand#44; that is the famous pistol grip stick shift for your right hand to enjoy. The instrument panel is full of original gaugesand#44; including a very useful tach. 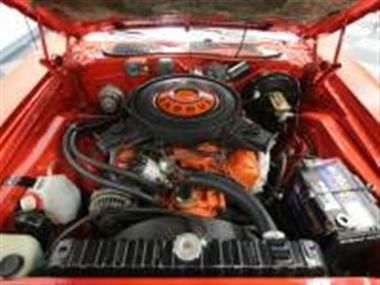 <br /> <br><br> When you peek under the hoodand#44; youll find an engine bay filled with big block Mopar power. The period-correct 383 cubic inch V8 It inhales deeply through a Carter AFB Competition four-barrel carburetorand#44; which helps contribute to the wicked snarl of the dual exhaust. 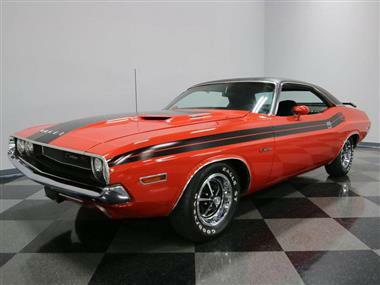 When you pair it with the full control of the four-speed manual transmissionand#44; this total package is a screamer that can be used to intimidate the rest of the muscle car crowd. And the power steeringand#44; power brakesand#44; and grip of Goodyear Eagle tires all keep this beast well in-hand.<br /> <br><br> The total package only has 7and#44;859 miles on it since being restoredand#44; and every picture you see only reinforces the story of this quality Mopar. So when you can find a muscle car thats rareand#44; fastand#44; and so well presented as this oneand#44; you know you have to act fast to take it home. Call today!!! 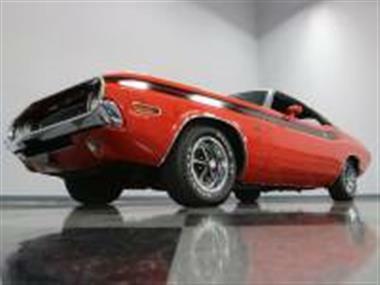 This vehicle is priced $38,126 less than the Average Market Price of $81,121 for a 1970 Dodge Challenger. This is a Good Deal as it's priced 47.0 % below market avg. The Pie chart below shows the number of ads within different price ranges.